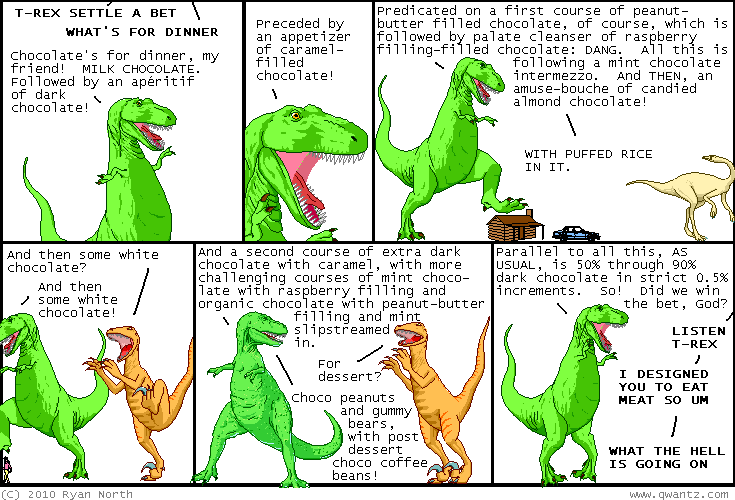 Dinosaur Comics - August 30th, 2010 - awesome fun times! August 30th, 2010: Webcomics Weekend is this November 6th and 7th in Easthampton Mass and it promises to be super excellent: it's a show featuring all webcomics, and as I suspect you to be a reader of webcomics, you might well enjoy it. I'm totally going, and you can get tickets here! I'm in the Kitchener-Waterloo area and someone - or someONES - here is an awesome knitter. I've seen knit socks made for parking lot poles (adorable!) and just yesterday I saw that someone had knit enough to cover an entire telephone pole, which was amazing! Knitters in the Kitchener-Waterloo area, to you I say: good work. One year ago today: let's say you have a giant heap of sand.